Aquaponics is thriving at the SPIN Center in Lynn, Massachusetts. After the successful introduction of plant crops like beans, watercress, and other vegetables, the aquaponics system now houses a healthy population of tilapia. Standing prominently by the SPIN (Serving People in Need, Inc.) Center’s street-side window, it has attracted the attention of curious passer-by as well as local media. Afterschool programs have visited to see the system, and SPIN has plans to organize field trips to see the system at work. 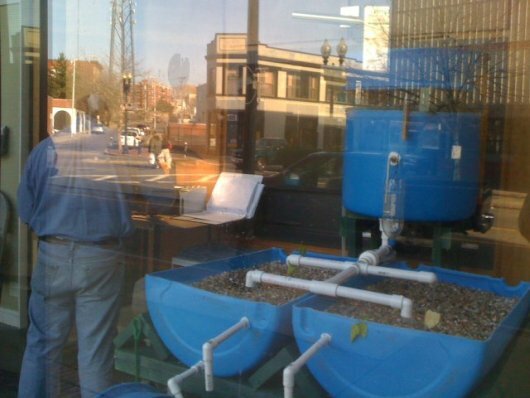 Passerby can see the new aquaponics project in action in downtown Lynn. Photo by Elisha Renee Goodman. Though built just six months ago, the Lynn aquaponics system is the culmination of an almost two-year long process of planning and preparation by a coalition of community-based organizations, labor unions, and religious and educational community leaders. Aquaponics originally came out of a plan to rejuvenate Lynn’s economy with federal money from the American Recovery and Reinvestment Act (ARRA). The idea started with Neighbor to Neighbor Massachusetts, a non-profit organization that works to foster economic and political empowerment in diverse, low-income communities such as Lynn. Soon after coming up with the idea, Neighbor to Neighbor convened a group of like-minded organizations to collaborate on writing a federal grant application. Tony Dunn, who works with North Shore Labor Council (NSLC) and the United Way, attended that first meeting and has been greatly involved with the project ever since. I spoke with him recently about the history of the project and his involvement in it. Tony was approached by Neighbor to Neighbor to help the organization work with existing coalitions to apply for federal funding. “I got sucked in early,” he said. The organizations that become involved formed the Lynn Coalition for Green Development (LCGD). The LCGD decided to apply for the Pathways Out Of Poverty grant. For Tony, who had little experience applying for federal money, the grant-writing process was exhausting. The grant took several all-nighters to finish. He did not press “Submit” until a few seconds before the deadline. Still, Tony was glad for the experience. “I enjoyed it. I enjoy the policy side,” he said. The LCGD did not get the grant. Despite the setback, the coalition remained focused on its goal to spur community-controlled economic development in Lynn. That’s when they turned their attention to aquaponics. The LCGD liked aquaponics because it combined environmental sustainability with economic development. Tony then introduced the idea to Mark DeJoie, Executive Director of the SPIN Center last summer. After some research, Mark decided that aquaponics was a good fit with SPIN’s program of housing and economic support to low-income families. SPIN, which is funded by the United Way of Massachusetts Bay, offered the LCGD space to build a pilot aquaponics system. So on October 2, 2010 a group of volunteers including Elisha Goodman and Carlos Espinoza-Toro from MIT CoLab came to the SPIN Center to build the aquaponics system. The pilot system has already taught the LCGD and SPIN Center much about the logistics of managing indoor agriculture. “We’re doing a science and a business project at the same time,” said Mark. The SPIN Center explains the aquaponics system. Video from the SPIN Aquaponics Facebook page. Aquaponics’ success thus far encourages both Tony and Mark to think about expanding the project soon. According to Tony, the LCGD’s next step is to begin a push for the Lynn city government to apply for federal funding. “There’s Green Communities Act, and it’s reasonable to push the city for it,” he said. Post by Chun Ying Wang. Thanks for sharing this story, Chun Ying. Very inspiring. Also, Elisha, Thank you for everything you have done with the LCGD. After 2.5 years, it’s great to see a real-life, working model for what might lead to sustainable wealth generation in Lynn.